On an annual basis, the Child Fatality Prevention System (CFPS) prioritizes prevention recommendations based on the review of aggregated circumstance data from child deaths as well as multidisciplinary expertise about the best strategies to protect the health and well-being of children. Establish a statutory requirement that allows for primary enforcement of Colorado’s adult seat belt law, making it possible to stop a driver and issue a citation if anyone (the driver and all passengers, regardless of seating position) in the vehicle is not properly restrained. Enhance the Graduated Drivers Licensing (GDL) law to increase the minimum age for a learner’s permit to 16 years and expand restricted driving hours to 10:00pm-5:00am. Mandate that all healthcare settings develop and implement policies to provide education and information about infant safe sleep promotion. Mandate all schools in Colorado implement a full spectrum of suicide prevention programming, including programs that promote resilience and positive youth development as protective factors for suicide. Support policies that ensure the long-term financial stability of free full-day preschool and free full-day kindergarten. Support policies that ensure paid parental leave for families. Mandate law enforcement agencies and coroner offices use the Sudden Unexplained Infant Death Investigation Reporting Form (SUIDIRF) during infant death scene investigations. Mandate the use of a suicide investigation form for law enforcement and coroners when investigating suicide deaths. Improve Colorado’s Traffic Accident Report to include more specific information about motor vehicle crashes. Strengthen practices related to sharing child maltreatment data across local agencies in Colorado. 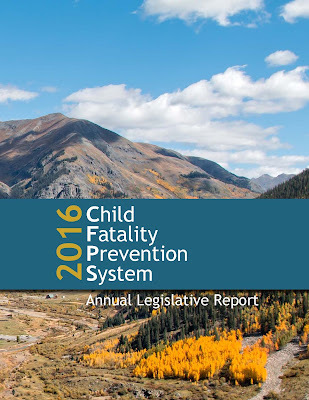 More information about each of these recommendations, as well as a summary of 2010-2014 child fatality data, is available in the 2016 Child Fatality Prevention System Annual Legislative Report.